NH: what struck you when you were editing it? DL: Two things struck me in particular. First, the resilience and tenacity of the central character, Butterfly, and the desperate predicament in which she finds herself. Abducted, imprisoned and alone, she’s struggling to make sense of what has happened to her while adjusting to the reality of her new circumstances. The second is this very specific setting of a remote, barren village in Shaanxi, north-west China. It’s such an insular place, cut off from everywhere else, with no mobile phones, no cars. You really get a feel for a way of life that has probably changed little over the years and is far removed from the urban one experienced by most Westerners travellers to China. The most shocking thing to me is that “bride-buying” here is an accepted practice. This is a remote village where all the young women have been lost to the cities, and all the male characters, including the local police chief and Party Secretary, seem to have bought into the need to kidnap women in order to find wives and continue the family line. They think there’s nothing wrong in this, which is one of the saddest aspects of the story. Of course, they are breaking the law – and yet the practice still goes on. NH: Jia took a lot of flak in China, even though he condemns kidnapping unequivocally, from women readers who accused him of being too sympathetic to the kidnappers. DL: Jia shows how these men are shaped by the bleak environment in which they find themselves. “Your birthplace determines what you are,” he writes in his Afterword. Bright Black behaves in an appalling way, but you also see occasional flashes of compassion and warmth within him. He’s not a complete monster. In a different environment, and with the benefit of an education, you feel this would be a different person. Butterfly wrestles with the question of whether Black is a good or bad person, and, at a significant point in the story, she reproaches herself for wishing him dead. Some readers may be similarly conflicted. NH: Are there any features of village life that particularly impressed themselves on you? DL: In addition to the casual brutality and violence, I found the squabbling and simmering tensions in this village particularly oppressive. There are no secrets and no sense of individual privacy. The place is awash with rumours and gossip. Even Butterfly, trapped in her cave, is able to learn much of what’s going on by overhearing the discussions and arguments on the strip outside. And when she does finally venture out and enter the village, she’s followed every step of the way by the family dog, who has been trained to follow her. NH: How do you think western readers will react, given the strangeness both of the background and of the storyline? 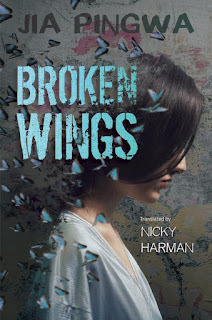 Broken Wings is out this spring, published by ACA Publishing.